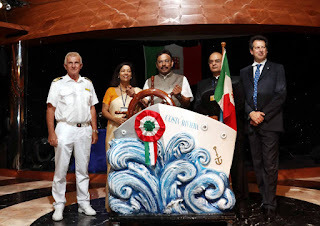 Stefania Costanza, Consul General of Italy, Shri. Sanjay Bhatia, Chairman of Mumbai Port Trust, Mr.
Director, Lotus Destinations, Representative of Costa Cruises in India. developing the Indian cruise market. operas and dancers that will captivate even the most well-travelled folks with spectacular performances. in the library for book lovers. recognizing opportunities in new markets and paving the roads in fulfilling the same. supported our efforts to boost Cruise Tourism”. neoRiviera, will take away nostalgic memories with them” .